Improve the performance of your sport horse by exercise testing and intensive monitoring of training sessions and competitions. Moxie Sport analyses the different measurements and draws up a suitable advice. By optimizing training, measuring results and analysing competitions you will achieve better performances at top sport level. Optimize the training of your horse with a tailor-made training program or advice. Due to targeted feedback, practical advice, condition tests and appropriate training programs you will know exactly how to improve your training sessions and thus your (competition) performance. As researcher at the Faculty of veterinary medicine, and embedded scientist (NOC * NSF) Dr. Carolien Munsters (PhD) committed doing research focused on workload, fitness and injuries in Warmblood sport of horses. Moxie Sport conducts scientific research on an appropriate training approach, tests product innovations for companies and hosts regular lectures on (inter) national conferences. Increase your knowledge on equine exercise physiology. Moxie Sport offers a variety of courses and workshops in the subject of sports physiology; heart rate measurements, training principles, horse-rider interaction, training programs and more. Also tailor made courses for companies or specific target groups are possible. Moxie sport supports and advises top athletes, passionate amateurs, coaches and trainers in the field of equine exercise physiology. Based on innovative measurements practices and competitions are analysed. 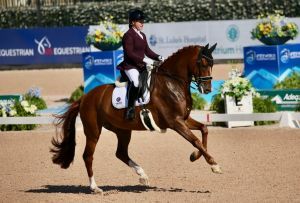 The results are translated to an appropriate advice, or a personalised training program to optimize athletic performance and to keep your horse healthy and fit. In 2010 Moxie Sport was founded by Carolien Munsters. She holds a PhD degree in equine exercise physiology. By translating scientific knowledge into practice, she helps riders and coaches to improve their performance. Moxie Sport guides, among others, the Olympic Eventing team and was able to contribute to the Olympic Games in London and Rio de Janeiro. Moxie Sport also supports international riders in various disciplines to European and World Championships. Finally, Moxie Sport offers courses in equine exercise physiology. Besides Moxie Sport Carolien is also active as a researcher at the Faculty of veterinary medicine (Utrecht university) and as an embedded scientist in the equestrian sport for the Dutch Olympic committee (NOC * NSF). More info on Moxie Sport. The course Equine Sports Physiology has made me aware of some pitfalls and misconceptions in horse training. It has made training with a heart rate monitor into a daily practice, and that gives us a lot of useful information. An interesting course that everyone that has to do with training horse should follow. Interesting course with good alternations between theory and practice. I‘ve got more insight in interpreting heart rate measurements. I found it an enrichment in general knowledge of horses and training principles which is actually necessary for every equestrian! After this you should be more capable to lead and train your horse. With, as a result, a happy athlete who is able to peak at the right time. This knowledge is offered to you in a pleasant interactive way with a good and solid link between theory and daily practice. Very educational and applicable in all disciplines and all levels. I was able to convert my humane knowledge to the concept of horse training. The course has taught me enough to make my own training programs and I’m now able to measure the results of the training programs by means of heart rate measurements. Also sufficient theoretical basis and pointers for further development and reading. Inspirational course with important information to teach you how to reach optimal performance in a horse. Useful lessons, with a clear translation to daily practice! I found it all very interesting. I sat on the edge of my seat the entire time! It has motivated me to want to learn much more about this. I found sad when the training was over. Very interesting and practical. In a clear but scientific way. Very interesting and with a practical approach. Clear information but still explained with a good scientific background. Clear information. I have got more insight in organizing training sessions. And the applicability of the heartrate monitor is much larger than I expected.